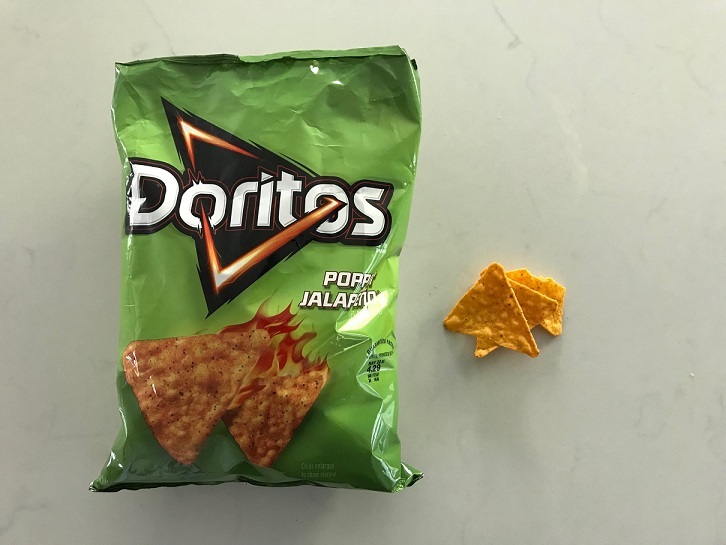 Jalapeno is one of our favorite chip flavors, but the expectation is that when the bag shows one of the chips on fire, and adjectives the jalapeno with poppin’ then they better be spicy. Unfortunately for this exploratory Doritos flavor, that just isn’t the case. Our expectations are almost always unfairly high for any new Doritios flavors available in our nearby grocery store. Perhaps the nostalgia enjoyment of Cool Ranch (or in Iceland, Cool American) being one of our all-time favorites, in the chip hall of fame, makes it impossible for the Frito-Lay brand to ever reach chip nirvana again with new tastes. While these chips aren’t bad, they don’t compare in flavor profile to other jalapeno chips by other major brands (Tim’s Cascade still makes the best). But to the first point, these Doritos are easy to binge, it didn’t take long for us to get past the recommended daily serving size. Maybe the lack of spice is to blame for this. One positive note, there was a much lighter aftertaste, the chip flavor didn’t linger on our breath for hours after like some others. Once again, probably a trade-off for not being that flavorful to begin with. Maybe this would be a good jalapeno chip to bring on an airplane to limit the damage done to those around you. Frito-Lay tends to produce high quality bags, we never feel like we’re getting too small of a serving in each bag, although we must shamelessly admit to occasionally being able to down an entire bag if our appetite is big enough.